Beautiful Celtic Cross Pendant faithfully captures all authentic detail of the original Croke Celtic Cross found at the Rock of Cashel, in County Tipperary. 33mm high and 14mm wide. 4g silver weight. 4.9g gold weight. With 18 inch chain. This modern Celtic cross was originally erected by the citizens of Cashel in 1895 to celebrate the Silver Jubilee of Thomas Croke, Archbishop of Cashel and Emly from 1875 to 1902. Croke was also the patron-founder of the Gaelic Athletic Association (GAA), the govening body of Ireland’s national sports, Gaelic Football and Hurling. The Cross of Cashel is a celebratory cross. The front face has three panels, the bottom one mentions Cormac of Cashel, the one above ‘St. Allbe at Emly’, and the top panel features Celtic style designs with the robed figure of the crucified Christ above. The reverse of the cross has Celtic designs with interlace, spirals and zoomorphic patterns in the Celtic art tradition. 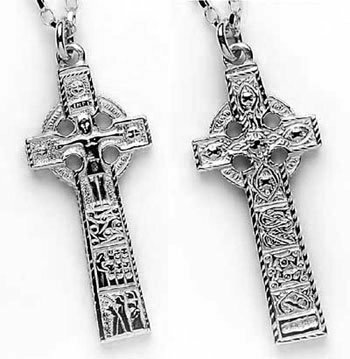 This attractive cross embodies the inspiration and spirit of the Great High Crosses of Ireland, carved and erected in the ninth and tenth centuries to celebrate learning and piety, great events and great men of their time.